There is nothing ambiguous about the color this sun-loving, low-water plant will bring to your garden. 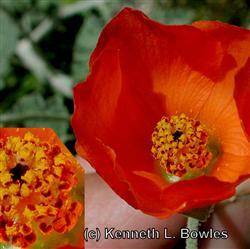 Desert Mallow produces spectacular orange to orange-red blooms on 1'-4' stems rising above fuzzy gray-green foliage. Use this plant to add color to a succulent garden or in a desert border where it contrasts nicely with Apache Plume and beargrass. With a little additional water in summer Desert Mallow will bloom almost year round. Expect height of about 3' with 2-3' spread. Cut back hard after flowering to encourage fresh growth and a fuller appearance.